Content - Silver Fox: Two Venues, One Solution! Two venues, each with an incredibly distinct aesthetic, Silver Fox Classic and Silver Fox Fuel are located in the north Mexican area of Juarez, Chihuahua, where they attract a varied clientele that ranges from young party animals to older, sophisticated diners. But while both have been brilliantly designed with stylish interior quirks tailored to their significantly different audiences, the management at Silver Fox decided that two different but equally versatile and stylish lightshows were needed too. They turned to ADJ dealer Adimsa to complete the installation, with lighting designer Edson Rivera tasked with kitting out the two collocated venues and bringing the new lighting vision to life! Seeking creative possibilities, Edson opted to use a wide range of ADJ and Elation lighting solutions – and the flexibility of these products proved an important factor, both in the success of the project and the reasoning for him choosing ADJ in the first place. Edson soon found that his ADJ lighting gave him loads of scope to get creative, complementing the stunning architectural features of designer Fransisco Anguiano perfectly. Silver Fox Classic is a lounge that caters to a 40+ audience, benefiting from a kitchen serving a delicious dinner menu and playing background music to accompany a relaxed night of socializing. For ‘Classic’, Edson was asked to create a space with an expensive, high-end look, providing customers with a stylish, relaxing environment in which to enjoy drinks or a meal while quiet music and subtle lighting adds to the atmosphere. Exploring the possibilities for this cozy 150-person lounge, Edson took the task head on and eventually settled on a range of ADJ and Elation fixtures. Having already been filled with plush high-backed couches, elegant bar seating and smooth wooden décor, Edgar wanted to embellish these features using subtle but effective lighting. In the central circular seating area, he mounted eight Inno Color Beam Z7s, with their variable beam angle (10-60?) and motorized zoom allowing Edson to easily generate immersive washes and narrow cutting beams. in a range of vibrant colors. Boasting seven 10W quad-color (RGBW) Osram LEDs, these effects can be created in a range of vibrant colors, with the Inno Color Beam Z7’s 64 built-in macros providing instantly available pre-set hues. In addition, the fast pan/tilt movement means that the whole of Silver Fox Classic can come to life with moving beam effects on nights when an extra burst of energy is needed. Meanwhile, the space inside the venue is also flooded with ambient light by four Ultra Bar 12 units, with Edson utilizing their super-bright RGB LEDs and all-encompassing 40? beam angle. Allowing him to get extra creative, the Ultra Bar 12 also offers three and six-section pixel control, while its tri-color LEDs provide access to an unlimited color pallet that includes a plethora of hard-to-reach hues that really make the architectural features of the venue pop! Elsewhere, Edson used eight Inno Spot Pros, as well as an Antari Fog 1200, to create sharper beams that cut through the fog effects in stylish white and amber hues. Finishing things off nicely, he also adopted 120m of Elation Flex Tape, which brings added color to the bar area. Over in sister venue Silver Fox Fuel, a different effect was required. Aimed at a younger audience than ‘Classic’, ‘Fuel’ plays dance music and chart hits, with music videos displayed on screens mounted to the walls around the venue. Therefore energy and cooler club-style lighting were top of Edson’s list. Offering an altogether different feel to Silver Fox Classic, the venue contains loads of exposed metal, with management wanting the space to feel like a ‘mechanic’s garage’. Helping fulfill this concept, the club is further enhanced by custom-made chairs with flame patterns, and props and furniture made from car wheels and other recycled materials. Wanting to appeal to this 300-capacity nightclub, with its open ceiling and younger, dance-oriented clientele, Edson chose to use six Lightning COB Cannon strobe effects, alongside eight Vizi Spot Pros, ten Event Bar DMXs and six Flat Par QA12s. Where Silver Fox Classic offers a relaxed atmosphere for quiet but sociable dining, management wanted ‘Fuel’ to offer a high-energy club experience. And helping bring an added intensity to the dance-floor Edson employed six Lightning COB Cannons, which offer powerful pulse and strobe effects, as well as super-bright washes in striking cool-white, thanks to their high-output COB LED sources and expansive 33-degree beam angle. Working well with the exposed metal, the Flat Par QA12s are pointed at the small stage – which hosts bands and karaoke – allowing Edson to flood the area with vibrant reds, blues, purples and whites for a modern, almost metallic feel. This capacity for versatile color creation comes from the QA12’s quad-color LEDs, which ensure smooth RGBA color mixing with no shadows for a professional, even result. With a color strobe settings too, the Flat Par QA12s are also capable of working with the Lightning COB Cannons to bring high-intensity strobing to the entire venue, giving late-night clubbers the ultimate party environment! Meanwhile, filling the venue with super-bright white light thanks to their white LEDs and controllable dimming, ten Event Bar DMX units are mounted to the ceiling, their individually controllable heads giving Edson the flexibility to generate intense strobing in creative new ways. So, whether he wants to produce cutting beams of white light or add even more energy to the dance-floor with strobe effects, he can. In addition, 50m Elation Flex Tape has also been used to turn the bar into another unique and attention-grabbing room feature (as if the drinks aren’t enough to draw clubbers to the bar!). Like in Silver Fox Classic, Edson also used a selection of moving heads to bring both movement and color to ‘Fuel’, with eight Vizi Spot Pros and, once again, eight Inno Color Beam Z7s bringing fast, flexible pan/tilt movement and beam/wash effects in a series of striking colors, with the reds, purples, golds and blues complementing the metal interior. While this wide selection of versatile ADJ fixtures enabled Edson to achieve the different, unique looks required for each venue, he found common ground where controlling these lighting displays most effectively was concerned. 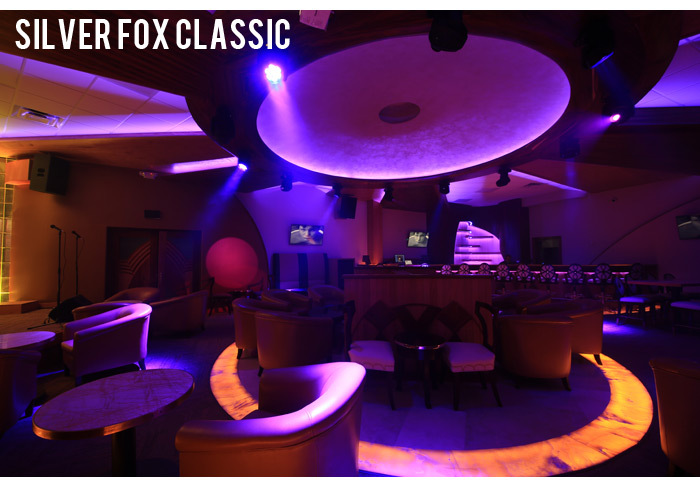 For both Silver Fox Classic and Silver Fox Fuel, he utilized Elation’s reliable four-way DMX splitter, the Opto Branch-4, providing him with an uninterrupted connection while distributing the DMX signals for the whole lightshow. In terms of software, Edson went for Elation’s Compu Cue lighting control package, giving him the creative freedom to generate scenes, chases and lightshows easily using DMX control, tailoring the effects to suit each of the Silver Fox venues. Thanks to the adaptability of our latest innovative products, Edson was able to meet the Silver Fox management’s request for two different but equally stunning lightshows. This flexibility was clear in the range of applications the effects were used for, with Edson utilizing some of the same fixtures – including the Inno Color Beam Z7 and Inno Spot Pro – to perform diverse roles in both venues. 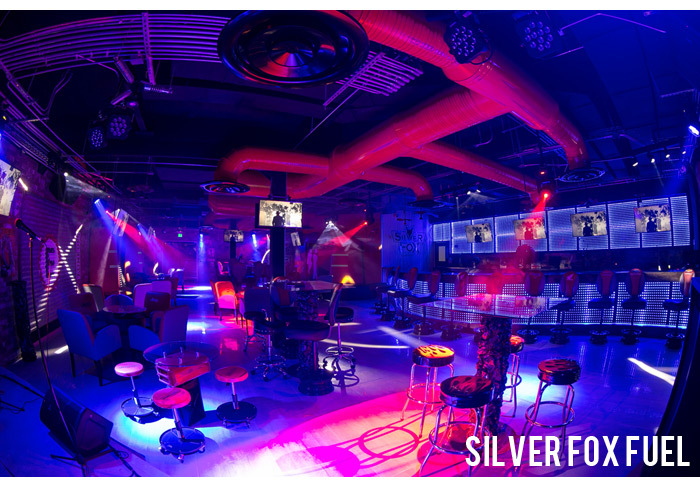 From the intense strobe effects and vivid color washes that complement the energetic feel and metallic interior of ‘Fuel’, to the subtle washes and sleek uplighting that draw high-class customers to ‘Classic’, the Silver Fox project shows that ADJ lighting isn’t just massively adaptable but also capable of distinctive effects that can be fine-tuned to suit any venue or space. As always, it was a pleasure to once again see Adimsa working with ADJ to deliver pure lighting excitement for high-end clients in a professional and passionate manner. When unique aesthetics, talented lighting designers and our forward-thinking fixtures come together, the results really are quite special!